Our Traditional Bronze profile sliding screen doors are constructed of strong extruded aluminum for long lasting durability. Strong, non-rusting internal nylon miter corners. Steel wheel assemblies with ball bearings. Full length vinyl bug strip. Pre-mitred, notched and drilled for fast and easy assembly. Fiberglass insect screening, vinyl serrated screen spline and spline installation tool are also included. This popular knock down made-to-size(K.D.) kit is a long-time favorite of contractors, leasing agents and homeowners. All necessary hardware is included, and the units are pre-mitred, notched and drilled for fast and easy assembly. Tell us the door size that you want, we'll do the rest! 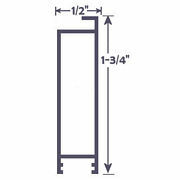 For help on how to measure for your replacement sliding door screen, click on the menu item on the right side of this page. * This patio door screen is cut to the sizes you specify. All hardware is installed, including the handle and rollers. The fiberglass screen wire is included. You simply assemble the door by using the provided corner inserts and then roll in the screen mesh. Instructions and spline tool are included. * The pictures show a white colored frame but Dark Bronze is the only color available for this door kit. * Please allow 2-5 days before shipment.